The theme of the two bishops can be found in many books – both in textbooks for absolute beginners and in more serious works. Having played in lots of tournaments and spent many years as a trainer I have noticed that a large number of young players and even fairly strong older players ignore this type of advantage and often surrender their bishops without a care in the world. To begin with let’s look at an example from one of my own games. 1.d4 g6 2.Bg5 Bg7 3.Nf3 c5 4.c3 Nf6 We have reached a Reti Opening with colours reversed. 5.Bxf6?! The first weak move. Why give up his bishop for a knight?! 5...Bxf6 6.e4?! This is already a mistake – first exchanging the bishop and then opening up the position. Here it would have been better to play 6.е3, strengthening the centre and placing a barrier against the enemy bishop, although Black already has an advantage. The pawn structure has yet to be determined, Black can choose: maybe d6-e5, maybe b6-Bb7-e6, or maybe d6-e6. In any case he has a rich scope for manoeuvring. On the other hand, if White simply captures the pawn with 6.dxc5, in order to ‘justify’ taking the knight, Black replies 6...Na6, winning the pawn back. 6...cxd4 7.Nxd4 7.cxd4 0-0, then d6, Nc6, preparing Bg4 or Qb6, attacking the d4 pawn; White has problems with the dark squares. 7...Nc6 8.Nf3 d6 9.Nbd2 0-0 10.Bc4 So we now find ourselves with a structure similar to a Sicilian Defence where Black has good pieces, standard play on the queenside and, of course, the advantage of the bishop pair. The dark-squared bishop is particularly strong, now that it doesn’t have any direct opponent. And what about White? Let’s look at White’s position from the point of view of the Sicilian Defence: a knight on f3 with a pawn on f2, a second knight on d2, a pawn on с3. What is White supposed to achieve here?.. 10...Rb8 11.Qe2 Bd7 12.0-0 a6 13.Nb3 b5 14.Bd5 Qb6 15.Rfd1 b4 Black went on to win easily. There are also many opening set-ups where Black or White give up a bishop for a knight. Often, opening databases or books fail to focus on this. For example, in the Nimzo-Indian after 1.d4 Nf6 2.c4 e6 3.Nc3 Bb4 4.a3 Bхc3 5.bхc3. In this line it’s quite understandable – in return for swapping a bishop for a knight Black has messed up White’s pawn structure and his counterplay is linked to this. In the line 1.d4 Nf6 2.c4 e6 3.Nc3 Bb4 4.Qc2 0-0 5.a3 Bхc3 6.Qхc3 b6 7.Bg5 Bb7 8.e3 White gains the bishop pair without damaging his pawn structure. So is White better? Of course not. White’s structure may not have been damaged but he has spent a fair amount of tempos, making two queen moves and placing it on с3 where it will be exposed to attacks, from both Nе4 and Rc8 - c5. There is an interesting set-up deployed against players who like the Nimzo-Indian: 1.Nf3 Nf6 2.c4 e6 3.Nc3 Bb4 4.Qc2 0-0 5.a3 Bхc3 6.Qхc3. This is clearly better for White than the "classical" Nimzo-Indian – his pawn structure has not yet been set. I always keep in mind the rule that states: don’t exchange your bishop for a knight when the pawn structure has yet to be set. Indeed, this position is much better for White: the pawn remains on d2, it has the choice of moving to d3 or d4, and at the same time the Black knight cannot settle into e4. There are many examples of players calmly swapping their bishop for a knight without realizing that they are granting their opponent the advantage. I am convinced that Black needs to play more actively in the last of these opening lines. 1.e4 c6 2.d4 d5 3.Nc3 dxe4 4.Ne4 Bf5 5.Ng3 Bg6 6.Nh3. White also gains the bishop pair in these positions. Sergey Tiviakov interprets them in a somewhat interesting way. But in my view, as a player who has deployed the Caro-Kann for many years as a core opening for Black, Black has good counterplay in these positions! And I do mean counterplay, rather than simply hanging around and waiting for White to strengthen his position. 1.e4 c6 2.Nc3 d5 3.Nf3 Bg4 4.h3 Bxf3 5.Qf3 e6 6.d3. This is a very interesting position. Black needs to play actively, otherwise once White completes his development and opens up the files Black won’t have any decent counterplay. 1.e4 d5 2.exd5 Qxd5 3.Nc3 Qd6 4.d4 Nf6 5.Nf3 c6 6.g3 Bg4 7.Bg2 e6 8.0-0 Be7 9.h3 Bxf3 10.Bxf3 0-0 11.Ne2. This is quite a popular position and I like it a lot. I recommend reviewing the game Caruana - Tiviakov 2010. Black failed to drum up counterplay, while White found strong moves and won. The game is instructive, from the opening right through the endgame. 1.Nf3 d5 2.c4 c6 3.e3 Nf6 4.Nc3 g6 5.b3 Bg7 6.Bb2 Bg4 7.Be2 Bxf3?! A somewhat strange move. Why capture the knight when White has not yet played h3? I enjoy playing this type of position and I’m sure I’m not the only one. Black believes that she has a strong position, but she has forgotten a number of key points. Opening up the game is to White’s advantage, it’s difficult for Black to execute a counter-strike, and even if she does it would be to White’s advantage. There is another important, yet often forgotten factor: psychology. White can strengthen his position, preparing to break open the position. Black can also strengthen, but she cannot open up the position. And once Black has strengthened her position as much as she can she will have to find an active plan, all the while knowing that opening up the position is bad... So here Black starts to thrash about. 13...Rfe8 14.g3 I don’t want to play the immediate e4. It’s better to first strengthen the position and only then charge forward. 14...b5 but after this е4 becomes a more powerful move, as the с6 pawn is now weakened. 15.Nb1 Moving the knight to d2, in order to execute the planned breakthrough. 15.e4 b4 16.e5 bxc3 17.exf6 Nxf6 18.Bxc3 a5 – maybe this is a strong continuation, but forcing events does not seem wise, all the more so as exchanging the е4 pawn for that on b5 is hardly nice for Black. 15...Rac8 15...Ne4 16.cxd5 cxd5 17.Rc6 Ndf6 18.Rdc1, grabbing control of the file. 16.Qe1 I should have followed through with my idea: 16.Nd2! and preparing е4. Here and hereafter this would have been the strongest continuation. 16...Qd8 17.Rc2 Qb6 18.Rdc1 Qb7 19.Qa5 Bf8 20.Ba3 White has decided to exchange the dark-squared bishops in order to weaken Black’s dark squares, but in doing so I lost my advantage. 20...Qb6 20...Bxa3!? 21.Qxa3 e5 (once again Black should have played more actively!) 22.Nd2 The position is not so rosy. 21.Qd2 21.Qxb6 Nxb6 22.Bxf8 Kxf8 23.Nd2 – even here White enjoys pressure. 23...Ke7 24.a4!? 21...Bxa3 22.Nxa3 Qb7 23.Qb4 23.Nb1 or 23.Qa5 was stronger. Another good move would have been 23.Bg2, preventing the bishop from being attacked with е6-е5. 24...bxc4? Opening up the position is to White’s advantage! Episodes like this are common in such positions. 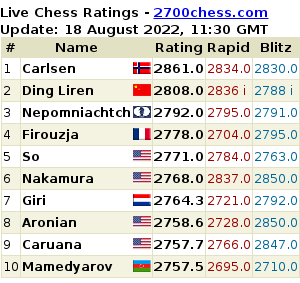 The position is approximately equal after 24...b4 25.cxd5 (25.Nb1 is possibly stronger) 25...cxd5 26.Nc4 Qa6 27.Nb2 Rxc2 28.Rxc2 Rc8 29.Qc1 Rxc2 30.Qxc2 e5. 25.bxc4 Qb4 26.Rc3 Ne4? 26...e5! was stronger, but with time trouble approaching I believed that White’s chances were better in any case. 27.Bxe4 dxe4 28.c5 Now White has a big advantage. The knight will be very strong once it gets to d6. 28...e5 29.Nc4 Rb8 30.Qd1 exd4 31.exd4 a4 32.a3 Qb7 33.Nd6 Qa8 34.Rc4 (the way to win was 34.Nxe8! Rxe8 35.d5). 35.fxe3?! The correct continuation was 35.Nxe8 exf2+ 36.Kxf2 Rxe8 37.Rxa4 Qd8 38.d5 with a decisive advantage. But not 35.Rxa4?? e2, as Black wins here. 35...Rxe3 36.Rxa4 Re1+ 37.Qxe1 Qxa4 38.Qf2 Rf8?! 38...f5! So there you go! A couple of inaccuracies could have been sufficient for White’s position to turn out to be not quite as clearly winning as it seemed a few moves earlier. 39.Re1 Qb3 40.Re7 Nb8 41.Qf6 The rest of the game wasn’t particularly interesting. Instead of winning comfortably the author of this article somewhat overcomplicated matters, but after a few adventures I did manage to win the full point. 1.d4 d5 2.c4 c6 This game was played half a year after the game shown above. The same type of position, the same situation. White plans to strengthen and is ready to open up the game, Black also strengthens but opening up the position is worse for him! While simply standing still is psychologically difficult. 17...bxc4?! 18.bxc4 c5 This illustrates what I have been saying. Black appears to have been strengthening, all his pieces are where they are meant to be; but he has to do something and it’s not entirely clear what! To create some sort of play Black is tempted to thrust forward – but the position would open up to White’s advantage. 19.Nd2 After the exchange of pawns in the centre the pawn on а6 remains very weak. 19...cxd4 20.Bxd4 Bf8!? 21.Qb1! 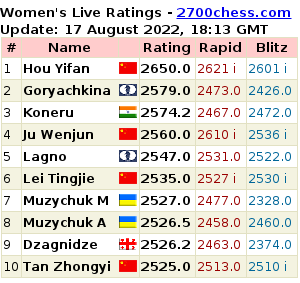 Rb8 22.Qa1 e5 Another advance that is better for white. The position is now more open. 23.Nb3 The advantage of the bishop over the knight is clear in the variation 23.Bb2 Ba3 24.Nb3 Bxb2 25.Qxb2 Nc5 26.cxd5 Nxb3 27.axb3 Nxd5 28.Bc4. 23...Qa4 24.Bb2 dxc4 25.Rxc4 Rb4 26.Rc2! We can now review the results of opening up the position. White has two powerful bishops, the opportunity to attack the pawns on a6 and f7, and his two rooks control the open files. Black has weak pawns, the knights don’t have outposts and his piece are not harmoniously linked. 26...Rh4?! There is nothing for the rook to do on the kingside – one man does not make a team. It would have been better to play 26...Rbb8. 27.Bf1 Ba3 28.Rc7 This reminds me of a well-known joke: the advantage of the bishop pair is that you can always exchange one of them. There is a grain of truth in this! 28...Bxb2 29.Qxb2 Rb4 30.Qd2 30.Rd6 Rb6 31.Rxb6 Nxb6 32.Nc5! Qa5 33.Nb7 Na4 34.Nxa5 Nxb2 35.Rb7 – this example line demonstrates just how hard it is to play Black here. 30...Nf8? In a difficult position my opponent made an error after which his position fell apart. 31.Nc5 Qa3 32.Qd6 Nh5 33.Qd5 Ne6 34.Nxe6 Rxe6 35.Qxe6 1-0. As you, Dear Reader, have probably noticed, play here can lead to one of two results. Some players deliberately plan to defend such positions, hoping to hold them, but I don’t think that this is the correct approach. Of course there are variations in which we have to play against an opponent’s bishop pair. I gave some key examples of these above. But if we are going to play such lines then we should agree to do so only if we get some counterplay, or else if we can easily neutralize our opponent – achieving a draw if we know exactly how to force one. Simply granting our opponent the bishop pair advantage with the chance to strengthen his position is a thankless task. Working as a chess trainer for around 11 years I have worked with many players of various levels and from different continents. I repeat, nearly all of my young pupils give up the bishop pair, without giving it much thought and sometimes with a feeling of pleasure!!! In particular, I have worked for over two years at the Zhansaya Abdumalik Chess Academy, where I have seen the following scene: after ordinary opening developing moves, such as, 1.e4 e5 2.Nf3 Nc6 3.Nc3 Nf6 4.Bc4 Bc5 5.0-0 0-0 6.d3 d6 7.Bg5 h6 White often continues 8.Bхf6(?!?). He surrenders first one bishop and then the other. We understand why young children like to exchange pieces, and not only bishops. But it’s best to instil in them, at least once they reach club level, that they shouldn’t exchange the bishop for knight without compensation! Experience proves that it’s better to show children the correct principles of the game (even if they are ‘difficult’ for their age), than to re-educate them later. To demonstrate examples of where the bishop is better than the knight, why it is so, and in which positions. And to explain the simple rule: don’t exchange the bishop for knight without compensation. then go for it! But not without compensation.